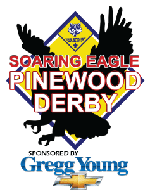 Join us for the Soaring Eagle District Pinewood Derby, sponsored by Gregg Young Chevrolet. Open to everyone... Scouts, Siblings, Parents and Pinewood Derby enthusiasts alike will have a chance to compete in this year's derby. Qualified Scout Division - qualify in the top 3 of your rank through your Pack's Pinewood Derby to compete (Must be verifiable by Unit Leader). Open Division - Subdivisions include Scout, Youth, and Adult. Overall trophies will be awarded to top ranks in each Scout or Youth divisions/subdivision. Honorable recognition for Adult division and best of show in all categories. Those who have placed in the top 3 of their rank in the Qualified Scout Division of the District Pinewood Derby are eligible to participate in the qualified division of the Council Pinewood Derby. Everyone is welcome to compete in the Open Division of the Council Race! Concessions provided by Pack 349.